The perception of Tinnitus has changed over the years from a disease of the ear to in actual fact a miss-communication of signals in the brain. An example of this, is that some Tinnitus sufferers who have had their Auditory Nerve severed will still have significant Tinnitus. While it is still generally believed that insult to the peripheral auditory system is a necessary factor in triggering tinnitus, recent evidence suggests that tinnitus is caused by abnormal activities resulting from cortical re-organisation. Sound Therapy via either acoustic or electric stimulation, uses external sounds to provide short and long term relief from Tinnitus. The interactions between external sounds are well established, as the external sounds can not only induce Tinnitus but alter its perception as well. Excessive exposure to loud sounds is the single greatest risk associated with Tinnitus onset, and for those with Tinnitus, sound overexposure may exacerbate it. However, sounds used at safe levels can be highly beneficial to an individual that suffers from Tinnitus. Sounds can not only distract a person’s attention away from their Tinnitus, but also affect the overall quality of their hearing. In some cases, people report noticeable changes in Tinnitus pitch or quality, following exposure to certain external sound sources. For example a variety of sounds, ranging from constant, low-level background sounds mimicking fire crackling have been used to mask the overall perception of Tinnitus. Additionally, many sufferers who use hearing aids or cochlear implants to treat a concomitant hearing loss, have reported reduction in their overall Tinnitus perception. With some even reporting complete elimination of their Tinnitus. This has led to sound therapy becoming a vital component in most Tinnitus treatment plans. Our approach is to introduce cortically interesting sounds to positively alter these abnormal neural activities for the purpose of Tinnitus suppression. Different from steady-state sounds such as pure tones and noises, which produce mostly onset and offset responses in the cortex, the temporally patterned sounds we use, such as amplitude and frequency modulated signals, produce highly syncronised and robust cortical responses. Many different sound therapy approaches have been marketed over the last couple of decades, with varying success. Some of the most widely used therapy approaches for which benefits have been reported include Tinnitus masking (wearing an ear level masking device), Tinnitus retraining therapy (which includes counseling and a masking component), and Neuromonics (a music-based approach combined with counseling). However, no single treatment is 100% effective across all Tinnitus sufferers, this is due to Tinnitus being multifactorial. At Chalfont Hearing Centre we have integrated this research into our approach. Our Tinnitus management pathway encompases a personalised treatment plan, based on the results from our Audiological Investigation. 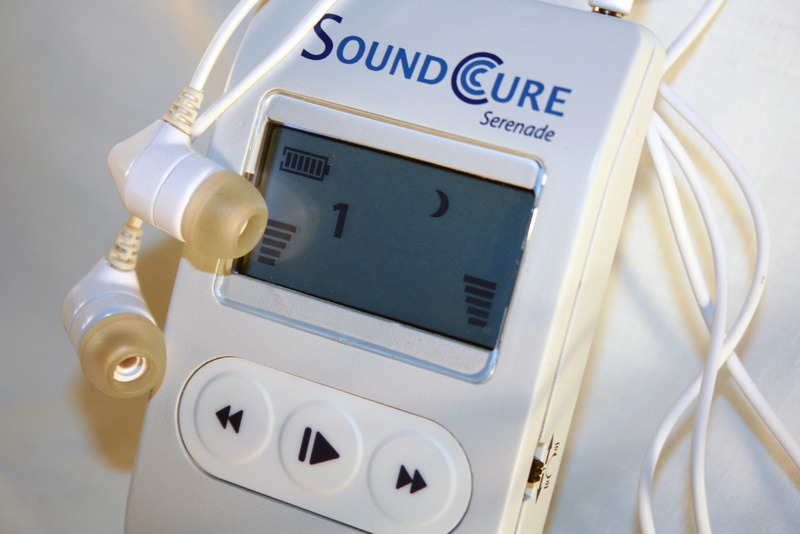 Soundcure Serenade – Serenade consists of three sound types: S-Tones, custom narrowband stimuli, and broadband sounds. S-Tones are the foundation of the Soundcure Serenade technology. Research has shown that these sounds can produce synchronised, robust neural activity in the Auditory Cortex and can offer immediate relief. They can also be used as part of an ongoing Tinnitus treatment program to provide long-term relief. Widex Zen Therapy – Widex Zen Therapy is unique because it is an integrated programme addressing all three dimensions of Tinnitus distress: the auditory aspects, attention and emotion. Zen fractal tones stimulate passive listening, reduce Tinnitus awareness, promote relaxation and interrupt the Tinnitus-stress cycle. Zen noise can provide additional relief from Tinnitus. White / Pink noise Generators – Tinnitus masking has been successful over the years. Pitch and intensity matched stimulus can provide relief for Tinnitus sufferers via distraction and habituation. These generators can be the entire system for patients with no hearing loss or can be integrated into hearing aids for patients who also have hearing loss. Some of the most succesful products are the Phonak Audeo Q90, Q70, Q50 (Tinnitus Balance), Unitron (Moxi, kiss, Quantum) Pro, 20, 12, 6, E (Tinnitus Masker), Siemens Micon (Tinnitus Noiser), Starkey Xino (Tinnitus Multiflex).